Google launched a real-time search service that that aggregates recent news articles, blog posts and messages from Twitter, FriendFeed, Jaiku, Identi.ca, MySpace and Facebook. Google tries to find the keywords that are suddenly popular in recent news articles, blog posts, Twitter messages. The most popular 10 keywords are available at Google Trends and they trigger a real-time search OneBox. "When they are relevant, we'll rank these latest results to show the freshest information right on the search results page. Try searching for your favorite TV show, sporting event or the latest development on a recent government bill. Whether it's an eyewitness tweet, a breaking news story or a fresh blog post, you can find it on Google right after it's published on the web," explains Google. Surprisingly, Google sorts the results by date, so you won't be able to use the service to find popular tweets, news articles that are frequently referenced, you'll still find spam messages and re-tweets. There are plenty of search engines that aggregate messages from micro-blogging services (Twingly, FriendFeed), but none of them managed to rank the results by relevance. "What's really happening in Twitter is that there are a lot of clues in it in terms of what's happening that's interesting overall. It's similar to what we see in Google Trends, where people will often type what they're interested in into the search box, and we can make some predictions off of that. So we are interested in being able to offer, for example, micro-blogging and micro-messaging in our search. Particularly in Blog Search and possibly in Web Search." Agree, I'd like to reply directly from Google! Wow ! its really a great feature of google.People can also surf for the fresh and updated content.Its a good feature added in google. How does one disable this stupid feature? I'd like to know how to disable it as well. It is simply taking up space with irrelevant search results. Sure, the results contain relevant keywords, but the actual content is such that it has no bearing on what I'm looking for. Just helped a teacher with a Visual Basic 6.0 issue. I am one of the few Microsoft people with VB 6 installed. Do it for just this reason. I don't use twitter period, it's a social app and should not be integrated into a search engine. I've seen annoying scrolling results 'drinking tea' and rubbish. What on earth is going on ??? If this cannot be disabled then it's goodbye google, hello bing/yahoo. Any word on disabling this "feature" yet? Should not be angry, is just another feature to make the searches more relevant. "Relevant" is subjective. When I search the internet, I am looking for content. RTS does not provide content that I am looking for, it just throws in irrelevant "discussion" or chatter in the top 1/3 of my browser. There are places for Twitter and Social Websites (like, actually at their websites). Google is not a place for this. I'm giving Bing a try. Google has essentially taken a clean, simple, straight forward interface and continuously messed with it such that it now looks the same but is more difficult to use. Thanks. Giant font? Thanks. Fade in? Come on.. it takes me longer to access any of those links now. And now this? I have to sort through more crap? Good stuff. This is the biggest steaming pile of excrement I've ever seen. I can find twitter feeds elsewhere. Or if google really wants to show latest activity on a term, create a new section for it just like there is a special section for images and video. But it sure doesn't belong in the main search results area. It's distracting, annoying, and takes up precious space. I don't care for it. When I run a search it's to find existing published information relevant to the search. I want thoughtful insight and information that helps me with my search terms. This new crap is totally irrelevant "buzz" that is in no way helpful. 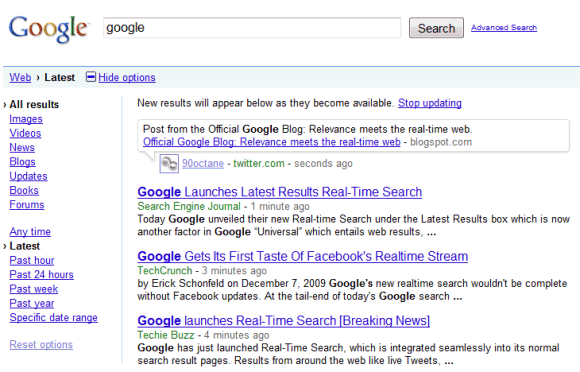 I created a Firefox add-on to embed Google's Real-Time search into Firefox. Anyone figure out how to get rid of this? How about creating a firefox add-on to block the real time search. This crap is horrible. I don't want to see people talking about how they sold off a certain stock to buy a car when I'm looking up a specific Ticker. Google should at least provide a search-specific setting to enable to disable this feature, as they do with safe-search. Haven't figured out how to disable real time search results, but the scrolling is annoying enough for things that are actively being tweeted. Google needs to play fair, and not turn on real-time search by default unless we ask for it. Please tell us how to disable this. Can we have a "&realtime=off" or the like? Stuff like this makes me try Bing.